It's been almost two weeks since the conference. Reflecting, the conference was a lot of fun, and educational. It's a shame that there are so many good sessions to choose from, and one can't go to all of them. However, I am thankful for the syllabus. Every presenter provided two or four pages of material for their presentation - often outlines and additional resources. The combined material encompasses over 500 pages. There is, of course, a lot of information in a presentation that isn't included in the syllabus, but I am hopeful as I go through it I will find a lot of good resources and research advice from sessions I missed. 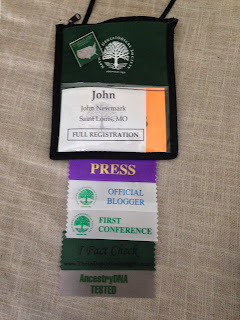 During the conference, I saw the masses of genealogists and wondered: Is there anybody here whose research intersects with mine? It was stated in the opening session that there were 2100 pre-registered attendees. What if: Pre-registered attendees were given the opportunity to enter surnames and locations of interest into an online computer application, which would then email those with matches? This shouldn't be difficult to code. Attendees would know beforehand that there was somebody they wanted to get together with and share notes. 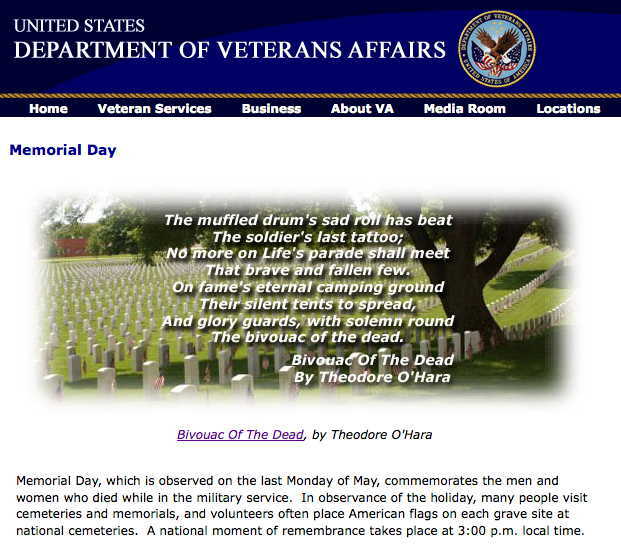 Below is my annual post for Memorial Day Weekend. I have many ancestors and kin who served in their nation's armed forces during war-time. I honor them on Veterans Day. However, the closest relative who was killed in action was my grandfather's brother, my great-uncle, Mandell Newmark. Tired from the first two days of the conference, I took things a bit more slowly. When I arrived at the convention center, I ordered a mocha latte and sat down on a couch and rested a bit. When the Exhibit Hall opened, I wandered the tables some more. I spent some time in the Ancestry.com area browsing their World Records. I ran into a work colleague and chatted for a few minutes. Neither of us knew the other was researching their family history. At 11am, I attended the presentation by Robert McLaren (RML) on Scots-Irish Research. My wife has Wallace and Muldoon ancestry, and it's possible I have McGregor or McAlpin ancestry. While it's not clear if our Scottish ancestors were part of the Scots-Irish migrations, I figured the session could provide some useful areas of research. RML led us through the history of the three main Scots-Irish migrations between the late 13th century and mid 17th century, and then the late 17th century, early 18th century migrations to the United States. Then several useful websites were shared, few of which I was already familiar. RML, the Clan MacLaren Society genealogist, also reminded the audience that many of the Scottish clans have Clan Genealogists who can be a great resource. I returned home, and had a relaxing Shabbat Dinner with my family. On the final day of the conference I attended three sessions. First, at 9:30am, Smiths and Jones: How to Cope with Families of Common Names, presented by Elizabeth Shown Mills (ESM). These research models can, naturally, be used with any surnames. By illustrating their success in two case studies - one for a Mary Smith, and one for a Joshua Jones - ESM was able to show their usefulness for all research. At 11am Julie Miller (JM) presented Organizing Your Genealogy Without Losing Your Mind. Emphasizing that "there is no best system, only a best system for you," JM presented the reasons we organize, the items genealogists must organize, and a variety of methods we can choose from. Whatever combination of methods we chose, JM suggested they should be "Simple, Consistent, and Maintainable." RAAH presented what sort of documents one was likely to find in these record sets, and where and how they could be searched or browsed. She also indicated when going through the Individual Citizen records, one would often find index cards that indicate the person is referenced in the other "Two or More Civilian" record set. However, not every person referenced in the "Two or More Civilian" record set has an index card in the "Individual Civilian" record set. And since none of the websites that host the images for these record sets have an index for the second record set, one needs to spend the time going through them image by image. After this session, I left the conference with the satisfaction that I had learned a great number of new resources, and received a lot of great research and writing advice. Today was Day Two of the National Genealogical Society's Family History Conference. I arrived shortly before 8am for my first session of the day: Transcription, Abstraction, and the Records, presented by Rev. David McDonald. I thought it would be an appropriate session to attend due to the series of transcriptions I have made for Amanuensis Monday. The documents he chose were late 18th early 19th century handwritten documents, reminding me of an 18th century will I was unable to decipher. Rev. McDonald led us through the process of transcribing and abstracting the documents, as well as discussing ways to identify when a document was written, such as the paper, ink, and script that was used. Most of what he discussed here was beyond my skill level, but I know if I had to read enough documents written in the 18th and early 19th centuries, I'd learn the difference. At 9:30, all the seats in the room were filled as D. Joshua Taylor, from Genealogy Roadshow, discussed The World's Periodicals in Your Hand: PERSI and Beyond. He indicated that while HeritageQuest has an archival version of PERSI (Periodical Search Index), FindMyPast has an up-to-date version to which they are slowly attaching digitized versions of the periodicals. He discussed how to best search the index, and how to access copies of the periodicals that aren't digitized. At 11am, Daniel Horowitz, Chief Genealogist for MyHeritage, explained how to Research Jewish Genealogical Records from your Couch. While the focus of his presentation, as indicated by the title, was on a multitude of online databases, he also included a few resources that would require getting dressed and doing a bit of traveling. There were several resources of which I was unaware and I am looking forward to exploring. Between the first two sessions, I had run into a friend I knew from a local writer's group. We agreed to meet up for lunch at the Embassy Suites, adjoining the convention center, which was offering a buffet spread. While it cost a little more than I would have spent at one of the food trucks, since it was a buffet, I was able to eat more than I would have. At 2:30 I attended Elizabeth Shown Mills' presentation Genealogy Research and Writing: Are You a Saint, Sinner, or Bumfuzzled Soul? I clearly hadn't had enough writing-related presentations yesterday. The focus of the discussion was on how to avoid charges of plagiarism with your wriitng, as well as the differences between copyright, plagiarism, ethics, and law. Most of this wasn't new to me, but it was a nice refresher. At 4pm, I ended the day learning Guidelines to Finding Polish Records from Amy Wachs. While Daniel Horowitz had discussed several databases on which I might be able to find my Polish Jewish ancestors, the focus of this presentation was less on the actual databases, and more of a background on Polish history, and how that has influenced the structure of its archival system, and the records themselves. I was excited to learn that Poland was slowly getting interested in digitizing some of its records. I am amazed at how much I have learned, and I am only halfway through the conference. After dropping our children off at daycare, I arrived at the conference just as the Opening Session was starting. I was able to quickly obtain my badge and lanyard at registration and enter the ballroom. After some initial awards and door prizes were handed out, J Mark Lowe presented. 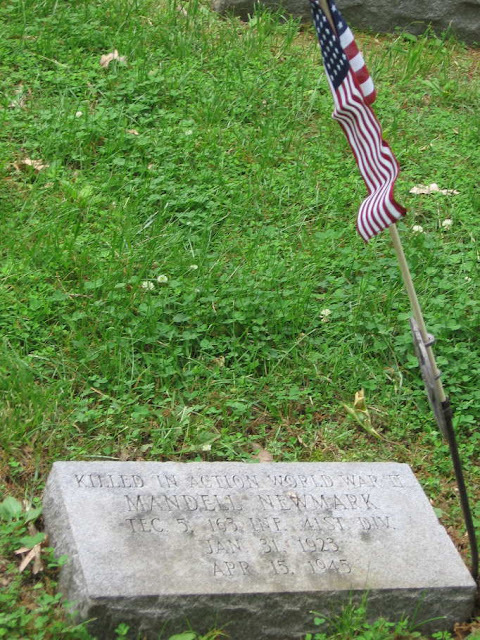 He spoke in the voice of "Charlie Floyd," born in November 1804. Charlie was named after a relative, Charles Floyd, who was on the Lewis and Clark expedition, and died three months prior. 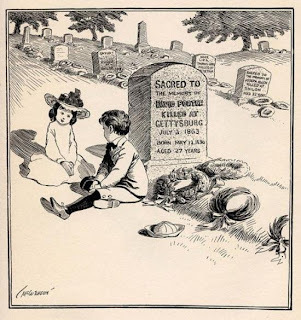 "Charlie" told many tales of his kin which included emotional reactions to a cholera epidemic, a little boy's favorite song, and dialogue. It was a moving performance, but left me wondering if all of it came from historical documents. The personal information could have been from journals, but it could also have been creative additions to add to the performance. Lewis, a Bald Eagle from the World Bird Sanctuary made an appearance (he was said to have been named after Meriwether Lewis), and J Mark Lowe led the room in singing Woody Guthrie's song, This Land is Your Land. After the opening session concluded, I browsed the Exhibit Hall. I met Dear Myrtle, Terri O'Connell from The In-Depth Genealogist, Susan Clark, and Diana Ritchie - four genealogists I've known through the blogging community and Facebook for several years, but had never met in person. At 11am I attended "Principles of Good Writing and Good Storytelling" presented by John Philip Colletta. He discussed how the literary concepts of setting, action, characters, conflict, and theme all could be used to make our family history more enjoyable, without sacrificing accuracy. He specifically mentioned words that are often referred to as 'weasel words' by essayists and fiction writers are necessary qualifiers for the historian. If something only 'probably,' 'likely,' or 'possibly' happened, we have to be clear to the reader that we are speculating. Throughout the presentation he utilized examples from his own writing, which I found very helpful, as this is a topic with which I struggle. My college English degree was in composition, not literature, but my focus in college was on fiction and poetry writing courses. I have a lot of experience writing professionally in the business world, but there I am expected to focus on the facts without adding creative flourishes. Family History writing requires adding these flourishes when the facts aren't in abundance, which can be a challenge. After this session finished, it was time for lunch. I had signed up for the luncheon presentation by Legal Genealogist, Judy G. Russell. Her presentation, "The Rest of the Story," started with the guardianship papers for siblings Andrew Jackson Battles and Samantha Battles. From there she presented additional documents that took us "beyond the begats" and told "the rest of the story." She also discussed how, as family historians, we are potentially "gatekeepers of secrets." She discussed the NGS Standards for Sharing Information With Others, as well as some other ethical considerations. The examples she chose to support her presentation were emotionally moving. I don't think anyone left the room with dry eyes. There was an hour before the next session, so I peeked outside. I had heard there would be food trucks available, and I was curious which ones - to plan ahead for lunch for the rest of the conference. I saw the food trucks for Yo Salsa, Deli on a Roll, and Slice of the Hill. Mexican, Kosher Style deli, and Italian. If the food trucks remain the same, it's a good selection. The final session I attended today was "Maps! Wonderful Maps" presented by Sayre and Sayre. Rick Sayre began with a discussion of Map resources, and Pamela Boyer Sayre followed with a case study. This was actually a 2-hour presentation, and I was only able to attend the first hour. There was to be a second case study in the second half. While I was already familiar with Sanborn fire insurance maps, several other map resources at the Library of Congress, the David Rumsey collection and elsewhere, were discussed. I took copious notes. After the first half of the session concluded, it was time for me to pick up my boys at daycare. I left the convention center tired, but confident I had learned a lot that would help with my own research and writing. Days two through four lie ahead. The National Genealogical Society Conference is next week – May 13-16 in St. Charles, Missouri. While the official activities begin on Wednesday, I know some attendees will begin to arrive on Monday and Tuesday for some local tours that are being offered. There's a Cracker Barrel across the street from the Convention center, but attendees may be seeking some other dining options. The Convention Center's website has a list of local restaurants running from fast food to fancy dining. I'll assume everyone is familiar with the national chains. Which restaurants unique to the local area can I recommend? Are you looking for some Bangers & Mash, Shepherd’s Pie, Fish & Chips, Welsh Rarebit, or just a good hamburger? I can recommend Llywelyn’s. I am only familiar with their original location in St. Louis’s Central West End (Note: The CWE makes an appearance in Anne Rice’s Queen of the Damned). They now have seven locations, including one in Kansas City. The St. Charles location is just under two miles from the convention center. Only one location. I’ve eaten here with friends, and had a great time. We went for the wine, stayed for the restaurant. Don’t remember a lot. Funny, that. St. Louis style pizza. A local chain. Nearest location less than two miles from the convention center. They deliver. If it gets hot, and you are willing to drive a little further, I highly recommend stopping for some of Ted Drewes’ Frozen Custard - It is a St. Louis favorite. However, they’re 22 miles/30 minutes from the convention center. I mention Little Hills above, but there are other wineries that aren't too far away. Here's a list of them. The ones in Augusta and Defiance, Missouri are about 30-45 minute drive from the convention center. The two I am most familiar with are in Defiance - Yellow Farmhouse and Sugar Creek. Maybe you are headed to St. Charles, and wondering about the area’s Kosher options? Here’s a list of Certified Kosher eateries in the area. As you can see by following the link, there aren’t many, and they’re all in St. Louis. The only certified kosher sit-down restaurant is Gokul (20 miles/30 min from convention center). That’s right, a vegetarian Indian restaurant. I’ve eaten there, and can definitely recommend it, but you won't find corned beef or chopped liver on their menu. I can recommend Kohn’s Kosher Deli for either of those, and more. (11 miles, 20 min). However, if you’re looking for a good reuben sandwich (something Kohn's will not serve you), or don’t mind if you get your meal somewhere that has one on the menu, your options increase. You'll find reubens on many restaurant menus, of course, but if you're looking for something authentic, my personal recommendations: Pumpernickels (10 miles/20 minutes from convention center) and Protzels (18 miles/25 minutes from convention center). Neither serves dinner. Note: If you’re looking for a synagogue at which to attend services, here's a list. However, the only synagogue in St. Charles closed in 2014, so you will have to drive.